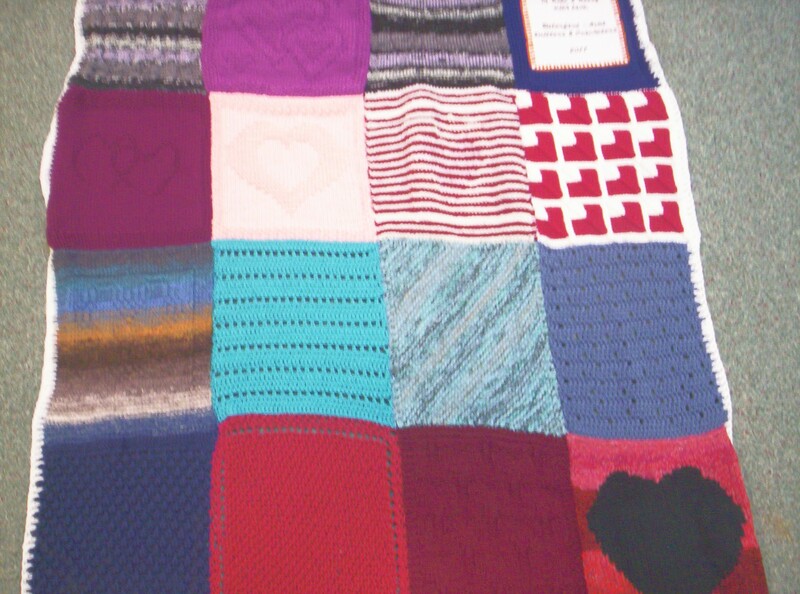 Tuesday night we were able to deliver the special afghan to our member and friend, Missy. She didn’t want her photo taken so we were only able to get one side shot, but she loved it. She wrote yesterday that her husband cried when he saw it and couldn’t believe all of us would spend that much effort and love to gift them with it. It was a pleasure and a blessing. 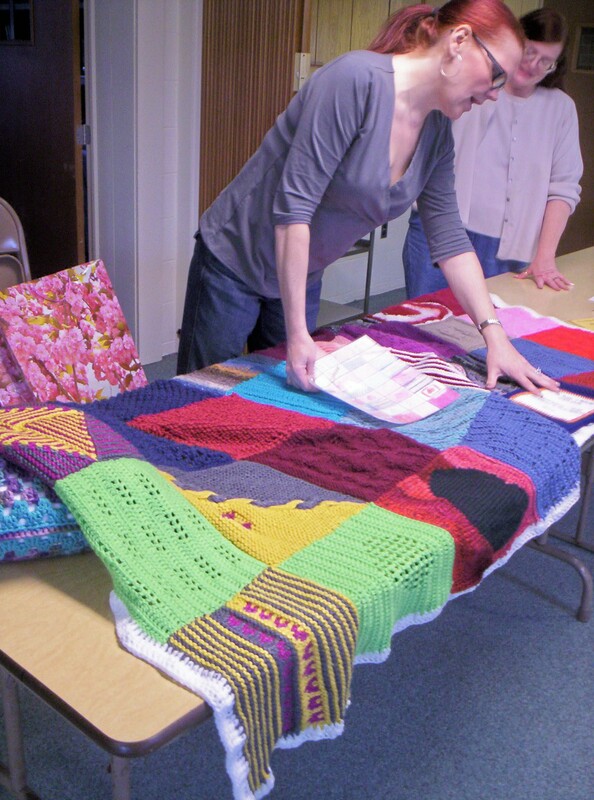 I had made a detailed drawing of the afghan so that she could look at each drawing and tell who (in the group) made each square (I KNEW she’d ask – that’s what is in her hand). It was a great night; gotta run – am babysitting my grandson and he’s getting awfully quiet! 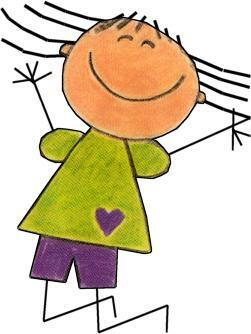 Today I’m officially declaring that I FEEL GROOVY! (for those of you not from the 60’s, that means I’m back to feeling GREAT!) It’s one of those ‘get lots of things done’ days – for instance, woke up too early (7 a.m.) and had lots on my mind so I set to getting it done. Tonight is the delivery of the special afghan for my friend so I made a card to go with the gift, then made a ‘clean out the fridge’ breakfast for three of us: (sort of a ‘farmers omelet’) 6 eggs, chopped onion/green pepper/black olives, 4 cooked hash brown patties (crumbled) and topped with lots of extra sharp Cheddar cheese – that hit the spot! Right now I’m waiting for the buzzer to ring on my oven – there’s a Blueberry Breakfast Bundt Cake baking; have to wait for that to cool before making the lemon drizzle icing to top it off. (I figured that since it’s a special night due to the presentation, I’m make a dessert for the group – of course, any leftovers will come home for us). While the cake was baking I put together a large lasagna for dinner. While that’s baking I’m also working on a new project: a knit baby bib using some really pretty variegated pinks/peaches cotton yarn that was a gift from the person who’s getting the afghan. The bib will go well with the pink baby afghan I’m ‘still’ working on. Sometimes I find that when there’s something special going on I tend to be a bit ‘tightly wound/hyperactive’ so I’m trying to keep myself moderated in order to not be totally exhausted by tonight’s knit group. (so far it’s not working very well . . . oh, well….sigh). ( was going to add a photo of the baby bib from the pattern, but apparently it won’t let me ‘copy & paste’ so you’ll have to wait until I photo the one I’m knitting – sorry). Cook ground beef and onion in large skillet on medium-high heat until beef is no longer pink, stirring occasionally. Drain fat; add oregano, cinnamon and garlic powder; mix well. Stir in broth, tomatoes and tomato paste. Bring to boil; stir in pasta. Reduce heat to medium; cover and cook 10 minutes or until pasta is nearly tender. Stir in spinach and 1/2 C. feta cheese. Cover and cook 5 minutes longer or until pasta is tender. Sprinkle top with remaining 1/4 C. feta cheese; cover and let stand 5 minutes before serving. Makes 6 servings. It’s another gorgeous Spring-like day – temp: 41 degrees F. and sunny. Spring – my FAVORITE time of year!!! Well, the sun’s shining and the antibiotics have finally started ‘doing their stuff’ – I’m actually feeling almost back to normal! Got some needed dish-washing/laundry catching up things done Saturday, sang in choir yesterday (although a little shaky), went to choir practice last night and saw just how far behind I am in learning the new songs for Easter. Oh well, it’ll come (I hope!). Went out today and got a huge present bag for the upcoming baby shower (remember I’m knitting a big pink baby blanket); I love our local dollar store – this bag is really HUGE and anywhere else would run a good $5-8, getting it for $1.00 is a really good deal! Combine chicken and spinach. Mix other ingredients, add 1/3 to chicken and spinach, mix well. Spray 8-by-8-inch dish and pour in mixture; top with remaining cheese mixture. bars while still warm.Makes 24 bars. MIX soup, milk, garlic and onion. Stir in potatoes. make packets. GRILL packets 25 min. or until done. sheet. Heat 10 minutes or until heated through. until beef is brown and onion is tender. Drain. of tortillas with some of remaining barbecue sauce. shredded cabbage mix. Roll to make wraps. milk; pour over the sugar mixture. I realize it’s been quite a while since I last posted; there’s a good reason – I’ve been sick. Starting almost a week ago I came down with a doozy of a sinus infection which wouldn’t let me breathe out of my nose at all. Using house-brand, over-the-counter nasal spray I just kept going (like the Energizer Bunny) but slowly started getting worse. After days spent reclining in a chair napping or reading, I relented Tuesday and went to the doctor. Am now on antibiotics and a ‘no side effects or complications’ nasal spray and am starting to feel like the ‘old me’ again. My dear husband has been great about doing the laundry and shuffling dishes from the sink to dishwasher, clean ones back out, etc. Tuesday evening I made a homemade chicken noodle soup (simply because I had to use the chicken I’d defrosted days ago) and that’s kind of kept us going until yesterday (Thurs) when I had help making a meat loaf and mashed potatoes. I even got an ‘assist’ on babysitting my grandson yesterday; let’s face it – when you just don’t have the energy to even eat, keeping up with a very boisterous 4 yr old is not very easy! I’ve managed to finish reading two books and finally am able to sleep through the night (with the occasional wake up from coughing from not breathing) so I’m ‘getting there’! I actually went grocery shopping today which (if I’d really thought about it, could have waited another day) kind of wore me out but am glad we now have TACOS scheduled for dinner! Something I wouldn’t have even thought about but the store had several packages of marked down Old El Paso Taco kits for fifty nine cents a pkg; each one containing 6 hard & 6 soft tortillas, mild seasoning sauce and 1 pkg seasoning to add to the hamburger while cooking, so it was well worth the change in the menu. Add to that a batch of about six tomatoes for 99 cents and that made the decision for me! Reading my good friend Momma’s (Mary’s) blog I realized just how far behind I am in posting. I’ve seen several robins in our yard for the past 2-3 days (signs of Spring here in Michigan) plus shoots of growing things coming up through the frozen ground AND, (typical of Michigan) another snow/ice storm Tuesday night. It was supposed to be a huge rain/sleet/freezing rain tapering off to 1-3 inches of snow but actually just left the ground & trees coated in ice and very little snow. The trees & bushes look really pretty like that and we’re all glad that we didn’t get more, as the accumulation could have snapped power lines and tree branches. It’s been cold the last few days (it’s 32 right now) – got up this morning to a balmy 22 degrees and sun. Crazy weather but not the first time I’ve seen this living in Michigan all my life. Also during all this sick time had to drive my sons occasionally; my husband has been a big help in just maintaining the normal schedule. I don’t even remember if I posted about middle son’s car accident – he’s fine but was hit front-on while he was stopped at a red light by a woman who had a .42 blood alcohol level. She fled the scene but the person parked behind my son took off after her and got the license number and called the police – they arrested her. Apparently she has no insurance (big surprise, right?) but after all this mess, he finally got his car back today, 2 weeks later. He will have to go file a claim in Small Claims Court to recoup some of the cost of his deductible ($1,000) – we’ll see how that goes. I’m just very grateful he’s fine – with that high of a blood level she could easily have killed him. Sick or not, life never slows down, right? In a small bowl, whisk together flour, cornstarch, cocoa powder and salt. In a large bowl, cream together butter and sugar. With the mixer on low speed, add in the milk and the extracts. Mixture will look curdled. Gradually, add in the flour mixture until fully incorporated.Shape dough into two logs, about 1 1/2 inches (or about 4 cm) in diameter, wrap in plastic wrap and freeze for at least 1-2 hours, until dough is very firm. Slice dough into rounds not more than 1/4 inch thick – if they are too thick, they will not be as crisp – and place on a parchment lined baking sheet. Cookies will not spread very much, so you can put them quite close together.Bake for 13-15 minutes, until cookies are firm at the edges. Cool cookies completely on a wire rack before dipping in chocolate. In a microwave safe bowl, combine chocolate and butter. Melt on high powerin the microwave, stirring every 45-60 seconds, until chocolate is smooth. Chocolate should have a consistency somewhere between chocolate syrup and fudge for a thin coating.Dip each cookie in melted chocolate, turn with a fork to coat, then transfer to a piece of parchment paper or wax paper to set up for at least 30 minutes, or until chocolate is cool and firm.Reheat chocolate as needed to keep it smooth and easy to dip into. Makes 3 1/2-4 dozen cookies. In a large bowl combine all ingredients. Pour into a 9 x 13-inch baking pan, which has been sprayed with vegetable oil spray. Sprinkle reserved crumbs over the top. Bake uncovered 1 hour. Add soup, 1/2 the broth, 1 can milk, and stir. Add cheese and remaining milk. Stir in cornstarch with the rest of the broth. Add cornstarch mixture to soup. Add spices and butter. Bring to a boil, reduce heat and simmer for 15-20 minutes. Add boiled potatoes and simmer 15 minutes more. For the best taste, let cool and reheat. To serve, top with chives and bacon bits. Makes 4 servings. should be drained, unsweetened tidbits. Arrange chicken in crockpot. Hope you are all in good health; enjoy this amazing Spring weather (whether you have sun & clear skies or ice & snow, like here)! Early this afternoon my husband and I spent an enjoyable hour and a half discussing our finances with our new financial advisor. We both really like his personality and ability to ‘put into simple terms’ what we need to know. Finally our funds are transferred from AT&T and now we have to wait another 7 weeks (seems like a very long time) to be able to start investing some of it into varied areas like stocks, church bonds, etc. No, we’re not going out on a limb, in fact, he put ‘conservative’ on our folder to classify how we want to go about this. It’s nice to know that we can begin to think about the ins & outs of our next car purchase, as well as considering a new computer for me (mine is loyal but VERY slow and very frustrating if you’re in a hurry to get something done). After our little financial adventure, we went out to lunch at Elias Big Boy (I was really in the mood for a “Slim Jim” (to those of you who are non-Michiganders – that translates into a really good ham & swiss cheese sandwich on a nice light bun). My husband had a patty melt and we both shared some really good fries and onion rings – makes these money adventures much sweeter when you know you’re going out to eat afterwards! I think we’ve finally decided to sell my husband’s old van (1993 Plymoth Voyager) to my oldest son’s friend – cash, rather than spend more $$$ fixing it up. That will leave us with my 1997 Ply. Grand Voyager which has a new motor and transmission; yes, it needs some work (new struts and fix the heater) but it will still make a good ‘beater’ car for the time being until we don’t need two cars. Right now we’re still in the midst of needing two for transporting children/sons/grandchild and that’s OK. I’m sure our next vehicle will be another minivan – both of us are ‘died in the wool’ advocates of them – great mileage, take the wear and tear we dish out and last a good long time. Middle son has his car in the shop to get it fixed after his accident last week. He’s doing fine, but that requires that one of us transport him back & forth to his multiple jobs. He’s been good about asking some of his friends to take part in this, too, so it’s not so bad. The only conflict happens when I have to (in some sort of order) (a) pick up youngest son after school when he’s stayed for extra help (b) transport grandson either to or from his nursery school (c) pick up or drop off middle son for work/or one of his clients (d) transport youngest to his practices. It’s working, so far . . . gets a little ‘hairy’ at times, but it’s working. Supposedly his car will be ready by the 24th – to me that’s a long time, but I’m not a car repair person. Not much else new – both husband and I are over the ‘sickies’ we had last week; we both still have some sinus problems but are not really ‘under the weather’ like we were. Dinner tonight was beef stroganoff and peas (peas being the side vegetable). It’s easy, quick and economical plus the family likes it. Last night I experimented a little on the Chicken Parmesan recipe of last month. This time I used defrosted boneless chicken breasts and partially cooked them first on the George Foremann grill, then put them in a 9 x 13 pan in which I had poured some spaghetti sauce as a base, topped that with the chicken, then covered the breasts with more spaghetti sauce and sprinkled on a liberal amount of grated Parmesan cheese and cooked it 350 degrees for 30 minutes. It was good – last time I tried using the breaded veal patties -I like the (real) chicken breasts instead of the processed patties – more flavor. I’m half way done on the pink baby afghan. Finished putting two rows of crochet border on the Knit group afghan and it’s ready to be given. I’m still waiting on another member who really wanted to participate and I talked her into crocheting two 10 x 10 squares; we’ll make her squares into a pillow to go with the afghan. I love her dearly but am not exactly sure she will be able to get them done in the time allotted (3 weeks-she has lots of varied groups/people she helps) so that’s why I thought if she doesn’t get the pillow squares done in time, we can still give the afghan. I’ve scheduled the delivery for March 29th, our next Knit Night. My friend who’s husband is the one who’s had the heart trouble came to Knit night this past Tuesday. She’s lost a good 30 lbs. ; there are times when you really wish there was something you could do to alleviate the suffering for your friends. I just keep praying for both of them. I still don’t know if her husband is even ON the heart transplant list yet; I know they were waiting to see how his body reacts to this LVAD machine he’s hooked up to 24/7. It’s so hard, knowing he’s only 36 years old. Well, guess it’s time to give you some more recipes, eh? Break uncooked spaghetti into halves or thirds, prepare according to pkg. directions; drain. In large pan, saute mushrooms in melted margarine until tender; stir in soup and water. Cook and stir until blended. Stir in spaghetti and all other ingredients except Parmesan cheese and paprika. Turn into a 9 x 13 baking pan. Top with Parmesan cheese and sprinkle with paprika. Bake 45 minutes or until thoroughly heated. Makes 8-10 servings. Prepare spaghetti according to pkg. directions; drain. Brown sausage, remove from skillet and cut into 1/4 slices. Mix all ingredients together and pour into a buttered 2-quart casserole. Sprinkle with Parmesan cheese. Cover and bake 50-60 minutes or until thoroughly heated. Makes 4-6 servings. In a large nonstick skillet, fry bacon over medium-high heat until crisp, about 8 minutes. Remove bacon bits and set aside, reserving fat in the pan. Add onions and salt and reduce heat to medium-low. Cook, stirring occasionally, until onions have softened completely and turned brown, about 20-30 minutes. Increase heat to high, add spinach and bacon bits and cook, stirring frequently, just until the spinach has wilted, about 5 more minutes. Add additional salt to taste and serve immediately. Serves 6. Put butter in a large pot till melted. Add finely diced onions over medium heat. When onions are golden add diced potatoes, broth and chopped up broccoli. Don’t worry if broth doesn’t cover everything. Put a lid on the pot and let boil on medium high heat for a half-hour. Now add the frozen spinach and put the lid back on for another ten minutes. Now get a blender and blend well the whole batch. When it reaches your desired texture add cheddar cheese and slowly add the milk. Add chopped chives and stir until everything melts together. If you need to thin it add ½ cup more milk. Serves a family of four or more! Comment from flyer: This is really great! Made it for a Super bowl party and everyone loved it. It has a little zip to it that everyone appreciated. It’s easy for company since I transferred it all to a crockpot set on warm and put out a loaf of homemade bread and a big bowl of crackers. Everyone could help themselves. Sometimes I make my own broth and to make fat-free broth. I chill my chicken broth. The fat will rise to the top and I can remove it before using the broth. or overnight. Yield: 8 servings. baking pan with oil. Pound steaks to tenderize. Combine flour, salt, pepper, and dry mustard. the meat. Place browned steaks in prepared baking pan. Saute onion and garlic in drippings until softened. bake 45 minutes. Remove cover and return to the oven. with a side salad for a complete meal. skillet by using it to both brown the meat and bake it. return to the skillet after the onion/garlic step. Fold in whipped cream and Oreos. more Oreo cookie crumbs. Chill overnight. For the past two days both my husband and I are struggling to NOT come down with a cold or bronchitis (him). Got up today with a stuffy head and feeling like someone sucked the strength right out of me. Have been ‘laying low’ and both of us are drinking lots of hot tea – seems to help. With so much ‘time’ on my hands, I started looking over my emails and discovered that I haven’t posted many recipes in quite a while, so thought today would be a good day for that. These are varied and very tasty-sounding (but will have to wait until I’m feeling better before I attempt any of them!). heat for 3-4 hours, stirring occasionally. then uncover and simmer an additional 10 minutes. over rice, noodles or potatoes. the seasoning packet and cover it with water. to cook it 2-3 hours as it said, it was tough. large enough, I remove the meat and add the cabbage. 3-4 hours or until veggies are cooked. Reheat the meat when serving. dry cake mix on top, then sprinkle the nuts (if desired). Pour melted butter over top of nuts. Bake 50-60 minutes. saying that helps me remember which way to do that). Being Frugal is a GOOD Thing! I know, to some it’s being ‘cheap/stingy’, but over the years I’ve learned that being FRUGAL is a good thing! For example, today I went grocery shopping at two different stores. Why? Because they both had good deals on various items. One store had Star Kist small cans of tuna in water 2/$1.00 – the other store, same item $1 each can! When shopping at one of the stores they had advertised their frozen meatballs $2.50 a bag; I couldn’t find them so I asked. Turns out they didn’t get the shipment and were substituting Armour froz. meatballs (normally $3.99 a bag). When I was going through the checkout I remembered the switch and asked the cashier (just to be safe): Good thing I did! They rang up for $3.99 – she asked her manager and I got them for the sale price. It pays to ask, sometimes! Going through the dairy aisle I noticed that (a staple in our house) cream cheese has made a HUGE jump in price from .99 cents a 8 oz. pkg. (normal price) to $3.19, same pkg.! (That’s for Philadelphia brand, but it wasn’t much better for Kroger brand). Another example of “Pay Attention” – walking through the Fruits & Vegetables section I spotted “Little Cuties” brand tangerines $3.00 a bag! (I don’t buy them because they’re usually VERY expensive). Upon closer inspection of the display (which was stacked higher than my head – the sign was partially blocked by the bags), I discovered the word: “Pineapples” under the price. I can just imagine the people who, like me, thought “What a bargain for these tangerines!” and bought them, not checking their receipt. I ended up buying navel oranges, instead, at the other store – 3 # bag $1.99. there’s also “Paczki (Punchki’s – for pronoun) Day. This is the Tuesday immediately before “Ash Wednesday”. Well, for all my frugality, I couldn’t resist buying a dozen paczki – cream filled. Yes, they’re decadent, yes they’re filling/calorie-ladened balls of fat/sugar/etc. but hey – once a year . . . I caved. They’re ‘calling’ me – and I’m about to submit, making a nice cup of coffee to ‘go along with’. The last time I bought them I cut one in half, giving the other half to my husband. The next day when I decided I’d have another ‘half’ – they were all gone! Middle son PIGGED OUT! (he’s skinny – he can afford the calories). Hoping you get to enjoy your day (maybe with a Paczki?). It’s a gorgeous day out there – 41 degrees, sunny, clear skies; I drove home from the grocery store with my windows down, just enjoying the nice weather. Hurry up, Spring! I’m READY! Sitting here today in lovely sunshine contemplating last night’s fund raiser dinner for my special needs group. It’s 30 degrees and sunny – a perfect day to get up and get ‘crackin’ at my household chores . . . and yet, here I sit! The chores can wait (they have until now, right? ); just wanted to go over the previous evening. We were planning food for 120 guests; I’m guessing we had, maybe 60? not exactly the large group we were hoping for, but the outcome was good: we raised over $450 and that’s always a great thing! For those attending there was a pasta ‘feast’ to behold: one of the women in the church made “Chicken Tortellini with Red Pepper Cream sauce” (ooooo, heavy cream – really decadent tasting! ), the leader of our group made “Chicken Alfredo” (using lots of Fredo – don’t think he minded much…small joke, sorry, couldn’t resist! ); also had two different types of Macaroni & Cheese, a HUGE vat of Spaghetti & Meat sauce plus loads of garlic bread, tossed salad with Italian dressing and (of course) my chocolate chip cookies. (We froze the extra cookies for our group snack – I know they’ll love them). It was a fast-paced 3 1/2 hours with preparing, hosting, dish washing/drying, cleaning up, etc. and I ended up with tired feet and a full belly – I certainly SLEPT well last night! Got to see a few people I haven’t seen in a good 15 years, so that was nice, too; all in all, it was a great ‘first time of this type of fund raiser’. Still working on the pink baby blanket; am almost finished with the first big skein of yarn (you know – those huge balls of yarn that contain 165 yards of yarn per ball). That said, it’s about 2 1/2 – 3 feet of knit afghan, and about 3 1/2 feet wide. Even using the simple 4-row pattern there have been some mistakes but unless you look very closely, you won’t notice them. Took me a good 1 1/2 feet to correct a simple ‘one extra stitch’ problem so that it wouldn’t show AND so that I was finally back to the original 163 stitches per row! YAY! What a mess! First there was a problem about 4 stitches ‘in’ from the beginning of the row – marked that with a stitch marker and kept going. A few rows later there appeared a problem about 1 1/2 feet into the row! Now, YES . . . I ‘could’ have just ripped out the row (which I did, several times) but finally gave up and just ‘kept going’. When I commence again this afternoon on that knitting I will FINALLY be back to 163 stitches and ready to ‘press on’. Whew! 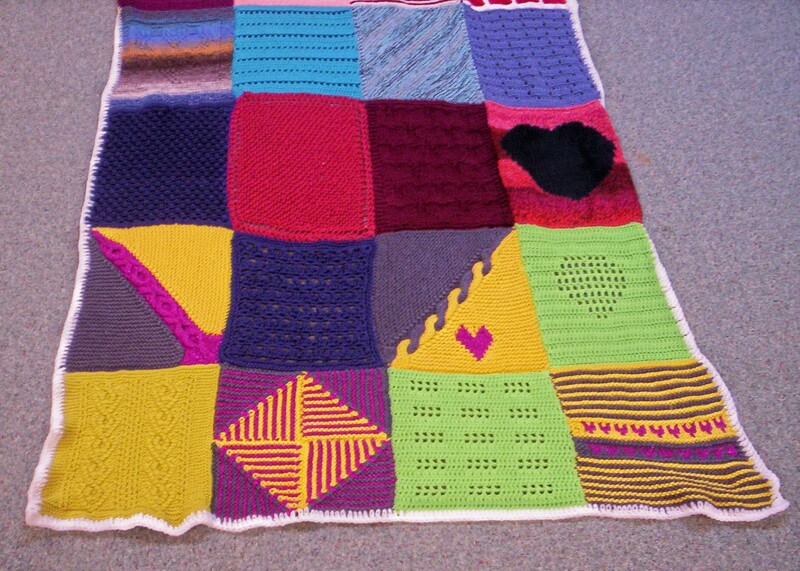 Also on the agenda for today is sitting down and beginning to sew together the ‘heart afghan’ squares – that makes me excited! I love seeing how all these individual squares work together to make a masterpiece of love and skill. Will post photos when it’s all done. Sun shining, lots of clean dishes to be taken out of the dishwasher and replaced with the sink full of dirty ones, laundry to wash, house bills to look over – guess my time here with you is at an end. Stay healthy, enjoy your day in some small (or big) way! It’s hard to believe it’s Thursday already – my mind is somewhere around Tuesday – go figure! Yesterday was a nice, calm day around the house – both my husband & I commented on how nice it was to just be able to enjoy ‘the calm’ (as in: before any of the boys come bursting into the house with their agendas!). The weather has been nice and clear, sunny and (before today) in the 30’s; today it’s nice, clear and very chilly! The temp. now says 28 degrees but I’d give a good guess that the wind chill makes it feel in the ‘teens’; I was out earlier and had to put on my hat & gloves – my head & hands were definitely feeling the chill! “Out and about earlier” – today is the beginning of baking cookies for the fund raiser for my special needs group. That event takes place Sunday night and they are expecting around 120 people to attend. Earlier today I was perusing the frozen cookie dough aisle at Gordon Food Services where I purchased four boxes of 80 cookies, each. Just pulled out the last tray I’m baking today (2 boxes) – saving the rest for Saturday. Actually had it down ‘to a Science’, so to speak – 14 minutes for 2 trays (baked together); take out two baked trays, insert two more. Wait about 4 minutes for baked cookies to harden a little & cool, move them to counter on newspaper to finally cool, put cookie trays under cold water to cool off, dry them and re-load. Right now I’m beat! I’m slowly learning that my legs tire out faster than my brain – hence, I tend to ‘give in’ to my aching legs and go take a ‘sit down’ (like I’m doing right now). Last night was my special needs group and a group of young kids from the church brought in crafts to do with my ‘kids’ – that was a fun night for all (lots of white glue to clean up afterwards, but it was worth it). Today was the cookie baking and later my grandson will be here. His dad called last night asking if it was OK for him to be here until around 11-11:30 p.m. as oldest son and his girlfriend would like to go to a concert in Detroit for an Irish band after they get off work. Of course! I said, thinking “Am I going to be TIRED when he goes home!” So far there’s nothing pressing on my calendar for tomorrow, so I’ll be able to sleep in – I’m going to need it! Been busy this week with Knit Night – 19 ladies in attendance, so that’s good. 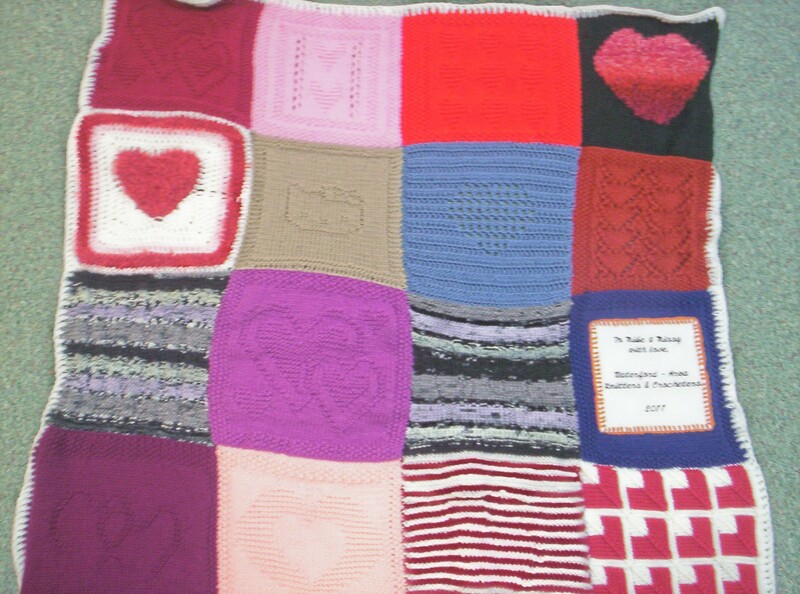 Finally got all the squares turned in for the special afghan for my friend (who’s one of our members) & her husband (the one who’s in need of a heart transplant – he’s only 36!). Fourteen of my ladies decided to participate in this effort and now I have 32 10″ X 10″ squares to sew together, then crochet a border on to complete it. 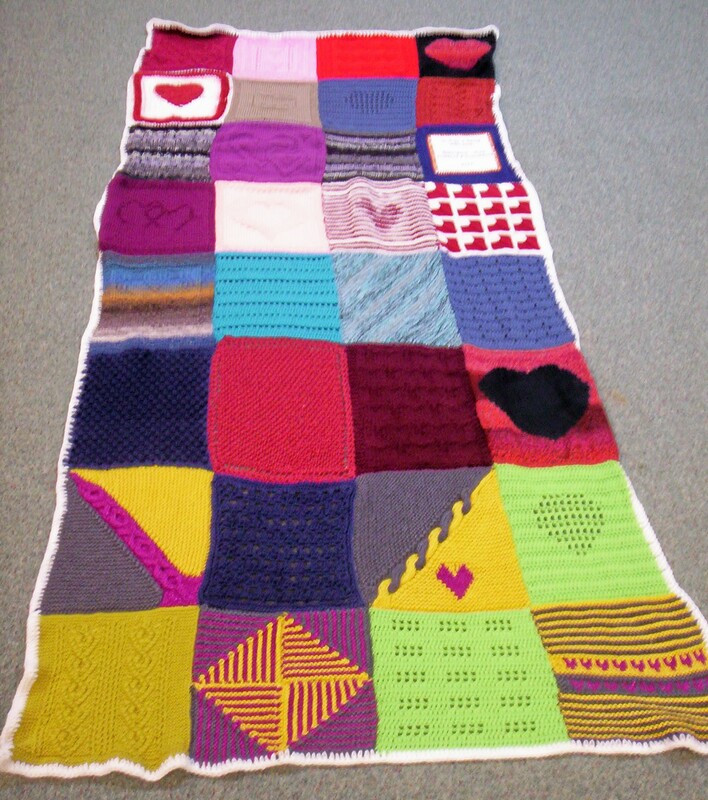 The completed afghan will measure about 40 inches wide, by 80 inches long. Am not exactly sure yet when/how we’re going to accomplish the actual delivery – whether we can coerce my friend (the wife) to come to a knit group (she’s currently his caregiver at home – he just got out of the hospital, again, this past Tuesday) OR whether we’ll have to schedule a special delivery to their home. Either way, I plan on taking lots of photos of the afghan and (hopefully) the delivery – which ever method works out at the time. 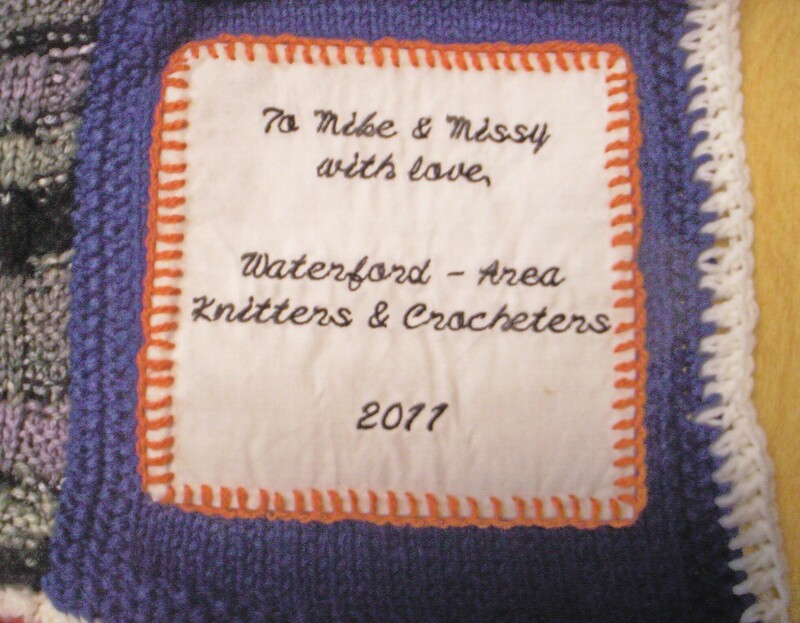 The ladies did an absolutely splendid job – most of the squares have a ‘heart’ theme; some are crocheted, some knit and some ‘knooked’ (a rather new method of working yarn which is like a combination of knitting AND crochet – very interesting! One of our members is currently putting together teaching videos for YouTube on the whole ‘knooking’ thing). After counting all the turned-in squares, I was one square short – so, you know me – got out all my heart patterns and found one I’d never done before, so sat down and created the last square. This was an interesting pattern in which it required, in one row, that you knit FOUR stitches together – now, I’ve knit 2 or 3 stitches together, but never four – it takes some getting used to, but creates the top most arch of the heart just perfectly. I was very happy with the outcome (although my right index finger joint is aching today from all the knitting – aw, poor baby – I know…). meat. Cover; simmer until meat is tender. Thicken gravy; serve over sliced meat. Wash, core and stem the apples, but don’t peel them. Stand them in a buttered mold and stuff them with 2/3 cup of the brown sugar the raisins and the orange peel. fill the tops of the core cavities with butter and sprinkle the remaining sugar over the tops. Place the mold in the slow cooker and pour the hot water into the cooker. Sprinkle the orange juice concentrate over the apples. Cover the cooker and cook on low for 3 to 5 hours or until the apples are tender. Serves 6. Combine strawberries and glaze; set aside. Slice Twinkies in half lengthwise. Place cream side up on bottom of ungreased 9×13 dish. In mixing bowl, beat cream cheese until creamy. Add Eagle Brand and mix well; fold in cool whip. Spread over Twinkies. Spoon strawberry mixture over top. Cover and refrigerate 30 minutes or until ready to serve. Spoon into individual serving dishes. Makes 16 servings. begins to thicken. Remove from heat and fold in chives and cheese. with the remaining potatoes and cover with remaining sauce. 375 º F., remove foil and bake for an additional 15 minutes. Sprinkle top with freshly chopped chives, if desired, and serve. cabbage. Simmer until cabbage is tender. secure with toothpicks.Arrange chicken in a baking dish. brown. Remove to cooling rack. Cool completely. top with half of raspberries. Repeat layers.